A stop at the soon-to-be-closing local creperie and a scan of Pinterest led us two ladies to create what we believe is a fabulous idea in the world of it-appears-fried-but-is-baked goodness. Don’t get me wrong, avocado fries are a fabulous idea, but when you’re craving French fries, well, I suppose it’s the next best thing. It was also way easier than I thought it would be. 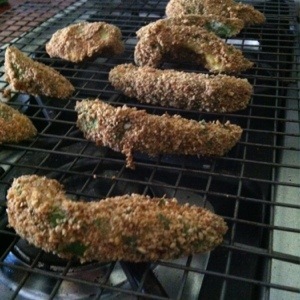 Preheat the oven to 350 F. In one bowl, mix the breadcrumbs with cayenne, garlic powder, cumin, and chili powder. In another bowl, place flour. In a third bowl, crack the egg and beat it. 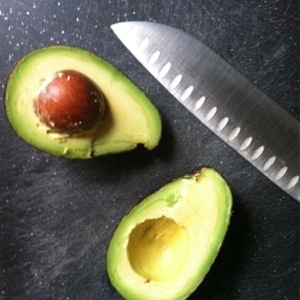 Slice ripe avocado into eight to ten slices. Dredge each piece in flour, then the egg wash, then the breadcrumbs. Place pieces on a wire rack that is set on a cookie sheet. It will keep the breadcrumbs from getting all over the stove and allow the avocado to bake. Bake for 20 to 25 minutes, or until breadcrumbs are golden brown. Absolutely love this idea! I’m definitely going to try it out. Thanks so much for sharing!